A variety of Strumento Ritocco modes modify paths. If an object is not a path (i.e. Rettangoli, Ellissi, text) it is first converted to a path. Unlike the Strumento Nodo, nodes do not need to be selected. All path modes share the Fidelity parameter. The range for the parameter is from 1 to 100. A low value gives a rough distortion using few nodes, a high value gives a smoother distortion but at the cost of creating large numbers of nodes. Note that any path distortion will affect the entire path, even the parts that are far away from the cursor. The tool has several known problems. If used on an open path, the path will become closed. It doesn't work well on straight lines. Thin calligraphic type strokes will suddenly disappear or change drastically in shape. A number of possible work-arounds: 1. Increase Fidelity, 2. Use the Tracciato → Semplifica (Ctrl+L) command (which results in a new set of nodes which may avoid the problem), 3. Use multiple «soft» strokes (i.e. reduce the Force parameter). The problems are from faults in the library routines used to manipulate the paths. A new library is currently under development. Push. (Shift+P) Default. Displaces path in direction of drag. Shrink. (Shift+S) Insets path near cursor while dragging. Grow. (Shift+G) Outsets path near cursor while dragging. Attract. (Shift+A) Displaces path inward toward cursor while dragging. Repel. (Shift+E) Displaces path outward from cursor while dragging. Roughen. (Shift+R) Roughens path near dragged cursor. The Strumento Ritocco was applied with a different mode to each of the text objects. In each case the cursor was moved from top to bottom. The mode is indicated by the text. The original text is outlined in red. A few short cuts exist: Ctrl switches temporarily to Shrink mode. Ctrl+Shift switches temporarily to Grow mode. The Strumento Ritocco is very useful for manipulating hatchings. 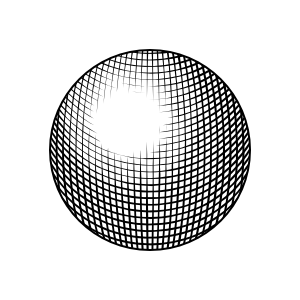 The hatching was created by using the Interpolate Effect twice to create two quasi-orthogonal sets of lines that were then clipped by a circle. When created, each set of lines belonged to one compound path. The compound paths were broken apart (Tracciato → Separa (Shift+Ctrl+K)) and then the strokes converted to paths (Tracciato → Da Linea a Tracciato (Ctrl+Alt+C)). Finally, the Strumento Ritocco was used in Shrink mode to narrow the width of the lines to create a 3D shading effect.